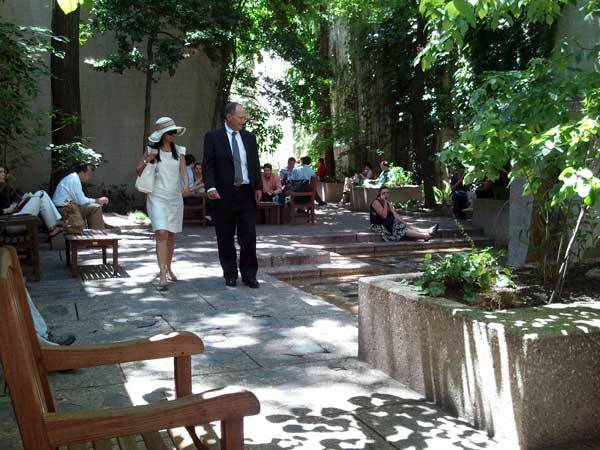 Designed by John Francis Collins, the park opened in June 1979 as one of the city’s early pocket parks. 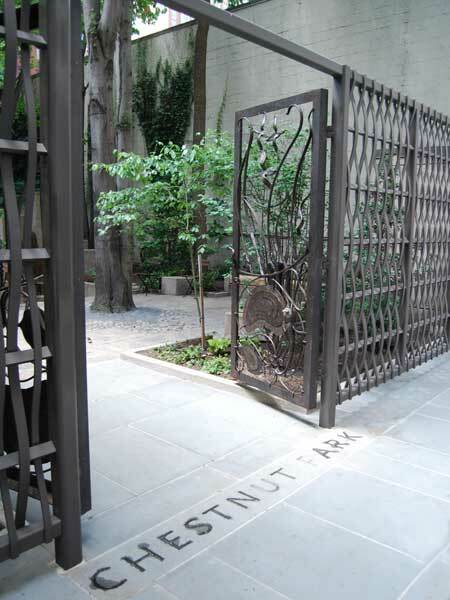 After visiting Manhattan’s Paley Park, philanthropist Dorothy Haas proposed the Philadelphia park, which was funded by the William Penn Foundation. 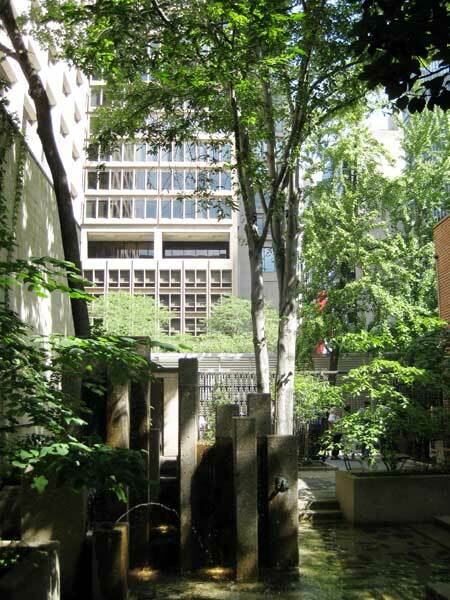 The narrow, rectilinear space, occupying less than 1/10th of an acre, is situated between two existing buildings in the city’s central core between Chestnut and Ranstead Street. Envisioned to reference the region’s rich native landscape and indigenous people, the park is defined by ivy-covered walls, constructed of local building and plant materials, and furnished with movable wooden furniture. The space is shaded with a diversity of native trees including redbud, dogwood, sugar maple, hickory, and American holly. 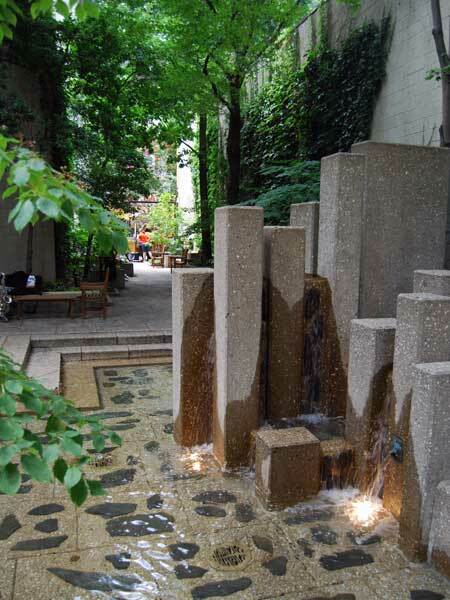 At the park’s center, a cascading fountain made of vertical cast concrete plinths abstracts Native American totems. Shallow steps provide access to the thin layer of water that pools at the fountain’s sunken basin. 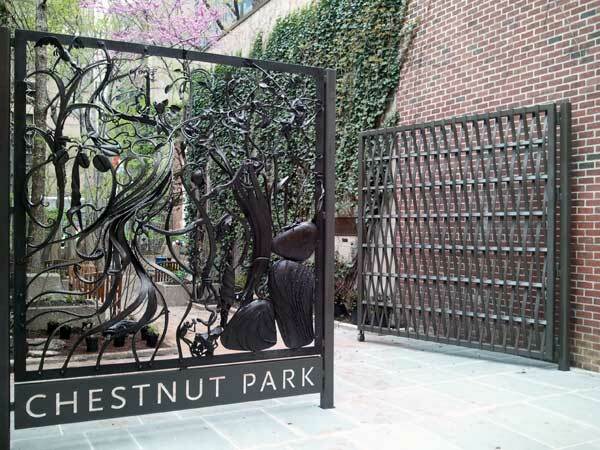 Two ornamental iron gates, sculpted by Philadelphia artist Christopher T. Ray, reference the flora and fauna of the Wissahickon Valley and tidal landscapes. The concrete pavers used throughout the park are distinct from the surrounding neighborhood’s more traditional red brick paving. In 2011, the park was renovated and re-opened to the public as John F. Collins Park.